A fun milestone to celebrate: Grab My Wrist turned 5 today! Trivia: This is the 388th post to this blog, and there are hundreds more to come. Many thanks to everyone who has been following along on this journey, and much appreciation for every word of encouragement. The next 5 years are going to be a daring adventure, and I’m thrilled to have you along. If my brain had a warning like my iPhone does it would be telling me that it’s overheating and needs to shut down for a while. Today I got my “Your Group Fitness Instructor exam is one month from now” email from ACE, the American Council on Exercise. Yikes. I need to be totally prepared for this. Failing isn’t an option (although it’s certainly a possibility.) It’s going to take some serious effort over the next few weeks, but I have to nail it. At the same time, I’m training diligently for my shodan (first black belt) test in Aikido. While the test isn’t until mid-December (thank goodness), there’s a run-through coming up in just two weeks. Lots more training to be done between now and then – and after, of course. I’m refining my focus, and really working on polishing the things I will need to demonstrate. On the home front, the weather is cooling off a little, so it should be possible to finish more projects remaining from this year’s spring’s house renovation project. Something about the temperatures being in the 90s and 100s just saps one’s enthusiasm for that sort of thing. I’ve gotten away from meditation, and “keep meaning to get back to it.” That starts now. I really need it. I need that settling down. With so many important things drawing me in conflicting directions it’s easy to feel scattered and overwhelmed, not knowing which to handle first. I need to find that centered, calm place from which to act effectively. Should be an intense few weeks. I think a really serious public health problem in our country, or at least our culture, is the constant messaging we get about how things get worse as we get older. It results in a fatalistic hopelessness, where people stop trying to stay flexible, stay active, stay strong, etc. they excuse all their aches and pains and weaknesses as “I’m just getting old.” Not to say age doesn’t have its challenges, but if we give up and sit on the couch, we are way more screwed than if we had kept active. I have just returned from George Ledyard Sensei’s 4-Day Randori Intensive at Aikido Eastside in Bellevue, Washington, near Seattle. 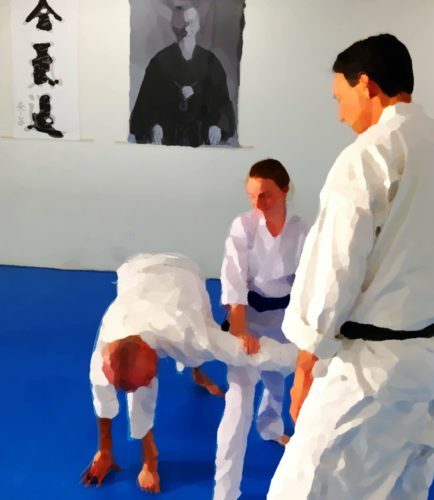 For my non-Aikido friends, randori is a multiple attacker scenario, usually one of you, three of them. It can be intimidating and exhausting training (and a lot of fun). Four days of it… Whoa. I first heard of this seminar shortly after I started training in Aikido. At the time it had been offered for 20 years! It sounded amazing. Four full days of weapons and randori work. One of the intended audiences for the seminar is people preparing for dan (black belt) exams. The word “Intensive” isn’t just in the title to sound cool on the flyer. Wouldn’t it be amazing to be able to go? A learning experience and rite of passage rolled into one. I always thought it would be fun to take the train up, too! 1,500 miles. See a whole lot of the country on the way. For the first few years I didn’t have the required rank (or skill, obviously) to go. When I first met Ledyard Sensei in person I mentioned that to him – that I was looking forward to the time I would be able to participate in this seminar. Then last year, when I did qualify to go, budget and timing interfered. Also, knowing more about weapons I became concerned about that aspect. My training is based on Saito Sensei’s weapons, and theirs comes from Saotome Sensei. I don’t know their forms at all – not even some of the terminology. I thought I would be lost and in the way. Underfoot, you know. So with that combination of factors in the mix I didn’t go. I gave up the whole idea of going. I figured I’d do a different seminar with Ledyard Sensei one day, but none really called to me the way this one had. Life went on… My teacher asked me to test for shodan (first black belt) this coming December (2014), so I’ve been training extra diligently. I’m not working regular hours now, as I lay the foundation for a major career change. Meanwhile, Michael and I undertook some home renovations, and I happened to put all the purchases on my formerly-unused Amtrak mileage credit card to keep them separate. I had time. I had a free train trip. I had enough rank/experience. I had a yudansha exam coming up. OMG! It was perfect! How could I not go? But being, ahem, “between careers” means money no longer grows on trees. Staying in a hotel and renting a car would have been a problem. I asked a friend who trains there if she knew of anyone who would let me crash on their couch, maybe in exchange for my paying their registration. Bless her heart (and her husband, too), she invited me to stay with them. I registered for the seminar back in May, and made the train reservations (2 days each direction). Then I got my gis mended, ordered a shinai (more on that in a moment), and packed everything I might need for an adventure on rails and at the dojo. Finally I was really going to go! I was pretty nervous, I’ll admit. Being on unfamiliar turf is always challenging. I tried to keep an open mind, remembering to enjoy and learn from whatever we did, but my hopes were so high there was a lot of potential for disappointment. I knew the group would be small. It’s limited for maximum personal attention. But you know how sometimes the first day of a weekend seminar is even smaller because people can’t get Friday off work? Yeah… For the first morning we had four participants on the mat. Me, three sandans (if I recall correctly), and Ledyard Sensei, a rokudan instructor with 25 years experience teaching this particular seminar (and way more than that, overall). That’s some serious hands-on personal attention. There was no hiding in the back row here! As the weekend went on, more people arrived, but there was still constant attention to each student, with immediate and specific feedback, corrections, and coaching. We worked on (among other things, and in no particular order) strategies for starting randori, direct techniques (dropping people where you wanted to), managing the relative positions of the attackers, using one attacker against the others (throwing them at each other, and using them as barriers or shields), seeing the lines of attack, judging (and creating) spacing and timing, executing techniques quickly (so as not to get bogged down with any one person), and getting out of trouble. We also worked on good (useful) ukemi for randori and with shinai, and safety in training at speed in groups. Something completely new to me, but it’s on their tests, was randori with shinai. Three attackers wielding padded bamboo sticks. The techniques are like our bokken work (sword-like), but with shinai you can actually aim to clobber someone and not do any damage if they fail to get out of the way. That means the attackers don’t need to hold back when they come after you. We did several exercises in dealing with attackers coming from different directions, and I got to see a few full-speed shinai randori with people who were preparing for their exams. On Saturday afternoon one of the dojo members took her shodan exam, too. I was lucky to be there to see it. It was a very impressive test! I meant to do daily blog posts after the seminar each evening, but I was too mentally and physically exhausted, plus we had to get dinner, and needed to be up early the next morning, so that didn’t work out. On the train ride home I alternated staring out the window with writing notes from everything I’d learned. It’s actually kind of hard to write on a train – too many distractions and too much being jostled about. But I wrote a bunch anyway. Assuming I can read my handwriting later I have a big chunk of a hardbound journal filled with notes, sketches, and ideas to play with and refer back to in coming months and years. Something that has been particularly touching for me is everyone who made it possible for me to participate in this event. This was not just some random thing I thought it would be a hoot to do on a lark – it was a long time dream and goal to be there. I try to be a pretty independent, self-reliant person, but I simply could not have done this without a lot of support. I’m so grateful to my friend and her husband for making it possible for me to be there. I’ve been on that side of hosting people during seminars, and while it can be fun it’s still a major disruption to deal with a house guest when you’re already quite busy enough as it is. They and their cats were awesome hosts, and I really enjoyed my time with them. I hope I can repay their gracious hospitality someday. Much appreciation to my husband, Michael, for making it possible for me to be away from home. He took over care of feeding of our donkey, an assortment of cats, and a friendly raccoon who expects dinner each night, not to mention keeping our acre of thirsty trees happy during hot weather. Plus he did a bunch extra yard work while I was away! Oh, and got me to the train station at oh-dark-hundred, and then picked me up again in the wee hours when I came home. Most importantly, many thanks to George Ledyard Sensei for his attentive, demanding, thoughtful teaching, for leading such a great community of aikidoka. Oh, and for some pretty funny stories over lunches, too. I hope to have many more opportunities to train with him. Whether you have heard of this seminar for years and just haven’t gotten around to going, or are learning of it for the first time here, go. Put it on your 2015 calendar now, and just go. I cannot recommend it highly enough. Every aspect of the event exceeded my already high hopes. It was challenging, technical, fun, useful, supportive, demanding, friendly, detailed, clear, funny, and intense. It definitely lives up to its name.